DiskSavvy Server is a server-based product version, which runs in the background as a service and is capable of performing multiple disk space analysis operations, save disk space analysis reports, generate various types of disk space usage pie charts, schedule periodic disk space analysis operations, submit reports to a centralized SQL database, perform disk space usage history trend analysis operations. DiskSavvy Server provides a full-scale client GUI application and a command line utility, which can be used to control one or more DiskSavvy Servers locally or through the network. 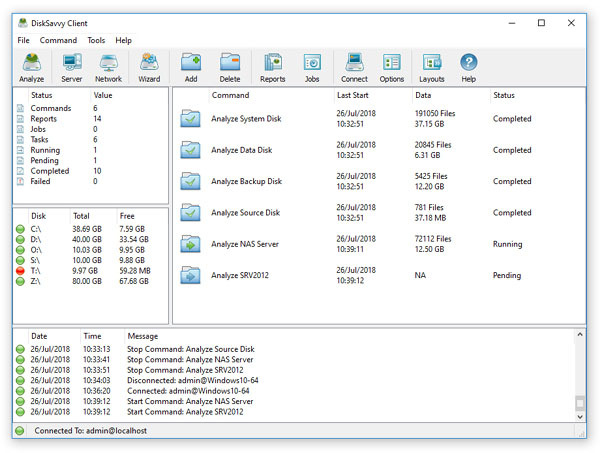 The DiskSavvy client GUI application provides all features available in the deskto product version and additional capabilities allowing one to perform multiple, parallel disk space analysis operations, schedule periodic disk space analysis operations and perform disk space usage history trend analysis operations. In addition, DiskSavvy Enterprise provides a complete web-based management interface allowing one to configure, control and manage the product using a regular web browser. The web-based management interface allows one to setup one or more disk space analysis operations, schedule periodic disk space analysis jobs, review disk space analysis results and save reports into a number of standard formats such as HTML, PDF, XML, Excel CSV and text.